The Church of Heavenly Rest was founded in 1865 by Civil War veterans to serve as a memorial to soldiers who died in the war. The first church building was a Victorian Gothic building located at 45th Street and 5th Avenue. By 1900, the church had 1,000 members. In the 1920s the church rector approached the widow of Andrew Carnegie, Louise, about purchasing the land on a lot on the southeast corner of 5th Avenue and 90th Street. Her husband paid $1.7 million for the lot in 1917 to prevent a tall building from blocking the light to his garden in a building just north. Mrs. Carnegie sold the lot with the restriction that the land must be used as a Christian church no higher than 75 feet through 1975. The church purchased the property in 1924 and merged with the Church of the Beloved Disciple. In 1925, Heavenly Rest sold their midtown property and worshiped at the Church of the Beloved Disciple for the next four years. Hardie Phillip (1888-1973) of Mayers, Murray & Phillip, the successor firm to Bertram Goodhue Associates designed the church. Goodhue (1869-1924) died before construction and Mayers, Murray & Phillip took over construction. 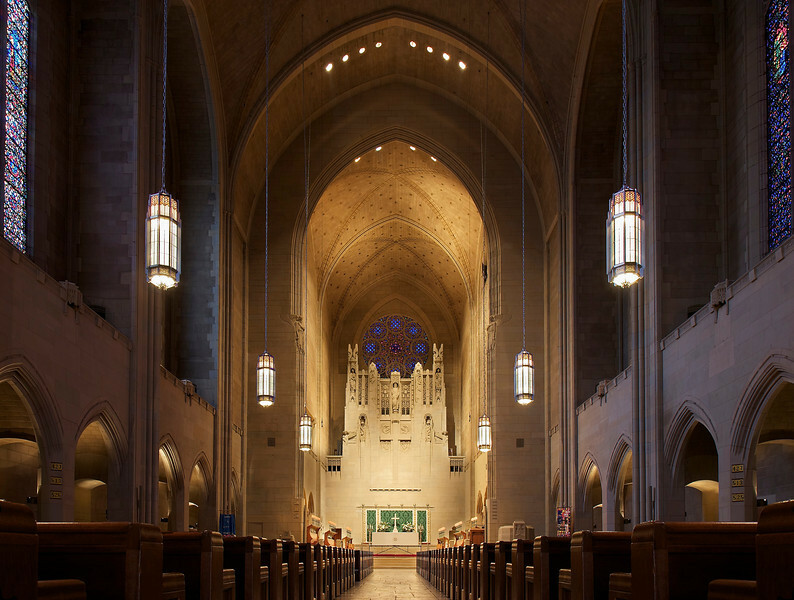 The website of the NY Chapter of the American Guild of Organists describes Hardie’s design as “…distinctive but stripped-down neo-Gothic building with Art Moderne elements that contrast broad areas of Indiana limestone with large open areas filled with delicate Gothic tracery.” The interior features a massive reredos designed by Earl N. Thorpe and carved by Edward Ardolino, which rises 50 feet above the altar below the rose window designed by J. Gordon Guthrie. James Humphries Hogan designed the other spectacular stained glass windows. The church was dedicated on Easter 1929. The church seats 1,100 people. President Chester A. Author’s funeral took place at the church and Gloria Swanson’s ashes were interred there.